The 10th Annual Kiteboarding 4 Cancer event in Hood River was pure success. Raising over $194,000 in a single weekend, the event continues to grow in popularity for kiteboarders as well as spectators. The event had 230 kiteboarders participate and approximately 3,000 spectators. On hand were 80 volunteers to help make the event run smoothly. “This event was extra special not only because it was our 10th Anniversary, but many of our beneficiaries (cancer survivors who have attended Camp Koru, for which Kiteboarding 4 Cancer fundraises) were at the event celebrating our 25th camp and their own journeys surviving cancer. This allowed many of the event participants to talk to them, ask questions, and meet a face to the cause,” said Organizer Tonia Farman. The Columbia River at Hood River is the perfect place for the event. A kiteboarder’s paradise with just the right temperature of water, just enough wind, and just enough blue sky and sunshine to add to the sport. Things may stay the same, more or less, in Hood River, but big changes are in the future, an additional kiteboarding event in San Francisco. “We are adding a San Francisco Kiteboard 4 Cancer in 2017. We will still have the event here in Hood River, and always will, but we are excited to expand the great vibes and stoke to other communities eager to kiteboard for a great cause,” said Farman. 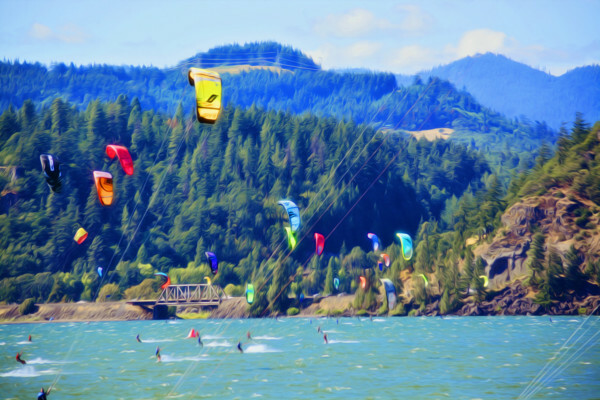 Next years Kiteboarding 4 Cancer event in Hood River will take place July 14 – 16. Dates for San Fransisco have not been scheduled at this time.